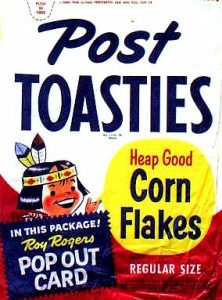 Posted on April 26, 2017, 8:00 am, by Ivan G. Shreve, Jr., under Anniversary, Classic television, Radio western. William S. Paley, the chairman of the Columbia Broadcasting System, was quite the fan of a detective series that aired on the network, The Adventures of Philip Marlowe. He suggested to CBS’ Hubbell Robinson (a network executive in charge of programming in New York) that a program be developed along the lines of “Philip Marlowe in the early West,” and the suggestion was passed along to Harry Ackerman—vice president in charge of West Coast programming. 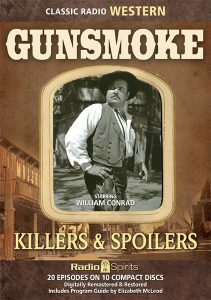 It was Ackerman who came up with the show’s eventual title (though the story details do vary depending on the telling); Ackerman later recalled: “It just popped into my head one day.” A Gunsmoke audition record was soon recorded (on June 11, 1949) using a Morton Fine-David Friedkin script (Rye Billsbury voiced the hero in “Mark Dillon Goes to Gouge Eye”), and another audition using the same script took place on July 15 with Howard Culver in the Dillon role. 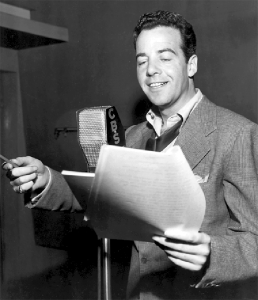 Culver appeared to have the inside track in the Dillon sweepstakes, but there was a teensy little snag: Howie was already the titular voice of Straight Arrow on the Mutual network, and contractually he was not allowed to do a competing Western series. As Ackerman and his creative team worked to get the Gunsmoke concept off the ground, another duo was hard at work on an idea for an “adult Western”: Norman Macdonnell (director-producer of The Adventures of Philip Marlowe) and network story editor John Meston. Born in Pueblo, CO, Meston had a lifelong obsession with the history of “the Old West,” and wanted very much to tackle a series that would present that time period in a more accurate light than the usual “white-hat-hero” kiddie fare that was usually associated with radio westerns. So he wrote a script titled “Pagosa” for another Macdonnell series, Romance, featuring a protagonist who had taken the job of sheriff in a small town. 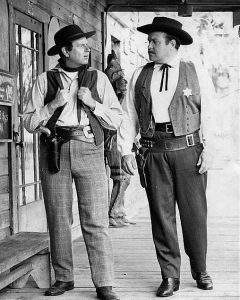 Meston and Macdonnell approached Ackerman about turning “Pagosa” into a regular series, which would be named after the sheriff’s character: Jeff Spain. 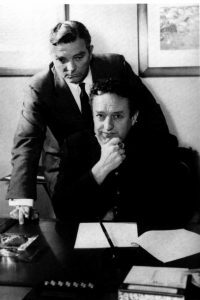 That’s when the two men learned of the efforts to develop Gunsmoke, and that any series proposal would continue under that name (Ackerman thought “Jeff Spain” a name more befitting a villain). CBS’ cancellation of an espionage series produced by William N. Robson, Operation Underground, cut down the tall grass and allowed Gunsmoke to get on the air—though Macdonnell and Meston had just one week to whip it in shape. Norm hired writer Walter Brown Newman to pen the premiere episode (giving him a recording of “Pagosa” to give him an idea of how the two men conceived of the show), and asked composer Rex Khoury to create the series’ theme. (Khoury’s now iconic “The Old Trail” was written on the very morning of the deadline!) 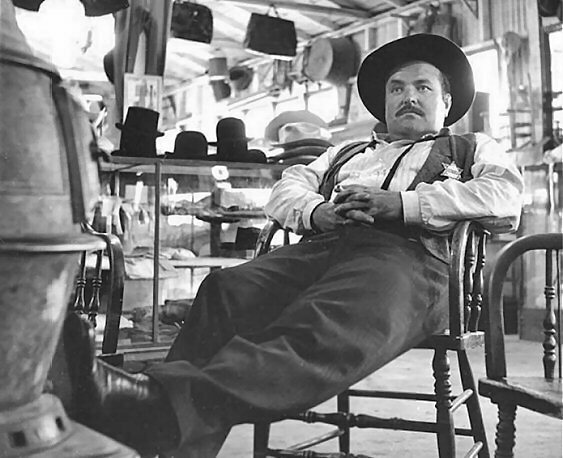 The creative team also had to locate an actor to portray Matt Dillon (Meston insisted the name be changed, because he felt “Mark” was too modern), and they lobbied hard for the thespian who had portrayed the heroic sheriff on “Pagosa”: William Conrad. CBS was a little reticent about hiring Conrad (they felt he was “overexposed,” and wanted an actor who “sounded like Orson Welles”), but it eventually became clear that Bill was the only man for the job. 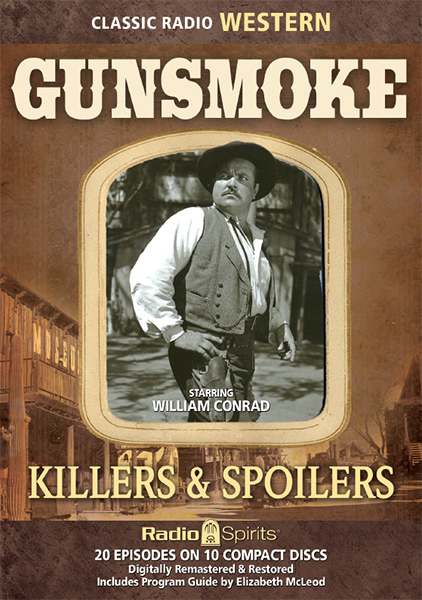 From its premiere on April 26, 1952, Gunsmoke was a stand-out in the aural medium. There are a number of factors involved in explaining why this is so, beginning with the first-rate scripts penned by John Meston. The broadcasts emphasized the raw, uncompromising nature of the Old West, as experienced by characters who spoke sparingly yet eloquently. The show took on complex topics that were not often featured in similar shows of that time, with nuanced portrayals of Native Americans, women, and minorities (notably Asian Americans). 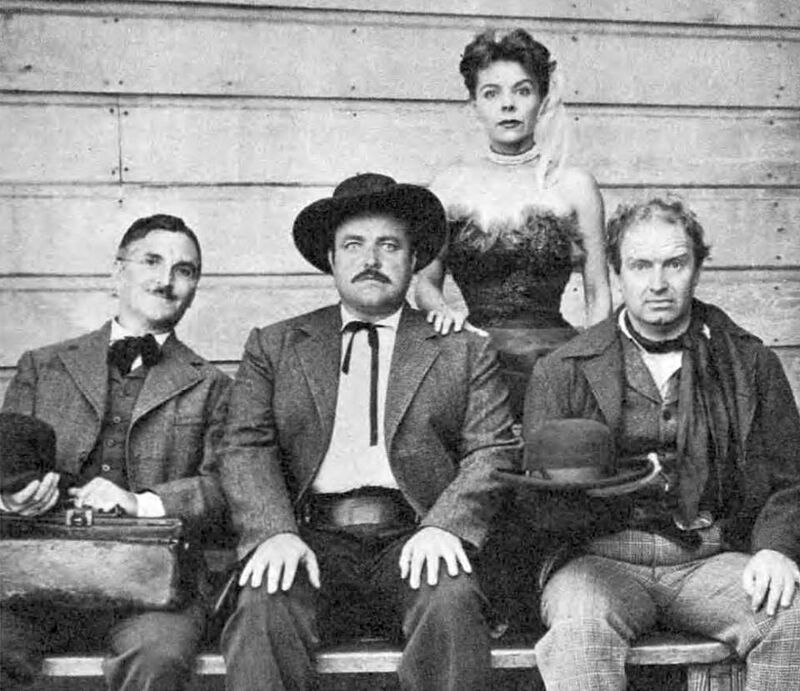 Though it sometimes seemed as if Meston wrote every Gunsmoke script, he would soon be joined by a “guild” of talented scribes that included Les Crutchfield, John Dunkel, Kathleen Hite, Marian Clark, and Antony Ellis. 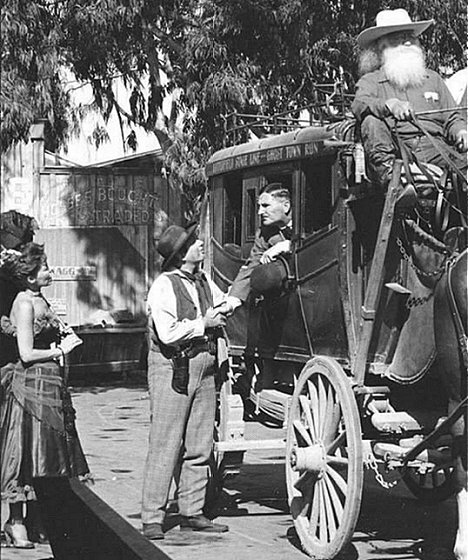 To breathe life into those scripted characters, director-producer Macdonnell made use of a “stock company” that he knew and trusted from other shows under his supervision. Those performers include (but are certainly not limited to) John Dehner, Vic Perrin, Lawrence Dobkin, Sam Edwards, Jeanette Nolan, Virginia Gregg…and so many others. Like Dragnet, Gunsmoke established a superiority in the area of “sound patterns” (sound effects), which were the bailiwick of three artists—Bill James, Tom Hanley, and Ray Kemper. Their “patterns” added a necessary touch of realism to each broadcast, whether it be the squeak of saddle leather as Matt Dillon rode out on the prairie or the creak of wooden boards as the Dodge City marshal strolled through town on patrol. A sustained series in its early years on radio, Gunsmoke’s popularity would eventually make sponsors sit up and take notice—at first, the show’s commercials inappropriately sang the praises of Post Cereals (Sugar Crinkles and Post Toasties). Eventually the series’ longtime sponsor, Chesterfield/L&M, started to pick up the tab. The radio version of Gunsmoke would run until June 18, 1961; by that time, the show had successfully transitioned to the small screen (it was the top-rated TV program from 1957-61) and would continue to be a solid hit for CBS until its final original episode was telecast on March 31, 1975.